How much do you budget for “fitness”? I used to pay $370 per year for a gym membership. Now we pay next to nothing since we’ve integrated exercise into our lifestyle. Initially, the budget change had more to do with childcare than money, and now we’ve embraced more productive exertion. If “pretending to be fit” sounds sacrilegious to health-conscious sensibilities, let me explain. As a former gymnast, I’ve had to come to terms with the fact that I’ll never be as strong as when I exercised 12+ hours a week. And we all have to fight the temptation for edited images of models and super-fit celebrities to morph our idea of a healthy body. All this “pretending” is my way of saying “don’t take yourself too seriously.” None of us can live up to our own ideals perfectly. I don’t exercise as much as I want to, but want to maintain physical and mental health. One of my big take-aways from traveling to India last summer was that everything doesn’t have to be perfect, and this even applies to important areas like health & fitness. My $370 per year gym membership was well worth the cost to me. I attended group fitness classes 4-5 days each week. Pilates decreased my back pain and cardio dance indulged my long-time dream of learning to dance, even if my talent isn’t commensurate with my interest. Enter baby #1. My gym didn’t provide childcare for kids under age 1. Then I heard about a $2, twice-weekly fitness class with free childcare at a local church. The class is the hardest I’ve ever taken, with better childcare than any gym. After going on on for 3 years, I threw out my back. Taking a break allowed me to realize that the class was way too hard for me. I could barely limp out to the car & buckle the kids in afterward. Let alone grocery shop or stay awake past 10 pm. Rather than enhancing my life, as exercise should, I felt drained and defeated. Quitting the class left me with more time and energy. Now I’m finding ways to avoid “sloppy skinny” without spending a lot of time or money. My favorite approach is a little unusual, but it’s so fun I have to share. It all began in 2010, when I took a group of high school students on a short-term mission trip to run a summer camp in Buffalo, NY. It was the week of the World Cup, and we couldn’t resist dancing to the catchy, official tune, Shakira’s remake of “Time for Africa.” We performed it as a “flash mob” surprise for the kids. It was so much fun, we continued the tradition, performing new and old numbers at dance parties (a favorite youth group activity) and weddings. Last weekend, I led my first official wedding flash mob. Planning this was so much fun, and I got to exercise while choreographing, practicing, and teaching the dance. My kids love dancing so it’s an activity we can do together. I’ve also used exercise videos from the library, Amazon Prime streaming, or Youtube. Kid-friendly exercise is high on my priority list for now. When my back is in working order, I might run behind my son on his bike, with his little sis in the jogging stroller. Now that I have a bike hitch I can put her in the bike trailer & ride behind him. Walking with two kids in the double stroller is also quite a workout. Hiking is a favorite when winter ends. Neil’s never been a gym rat, but his desk job has him bemoaning his physical atrophy. Apparently cube-sitting is our generation’s health equivalent of smoking. His exercise consists of manual labor around the house and garage, and I’m not just talking changing light bulbs or motor oil. Last summer he replaced an exterior wall or our house and our deck. In addition to saving us at least $6000, he also got a lot of exercise! He prefers productive activity like biking to a destination, working in the yard or garden, running with a friend, or wrestling with the kids. He’s also enjoyed recreational sports, including a baseball league last year, basketball with friends, and a men’s morning basketball group at a church. 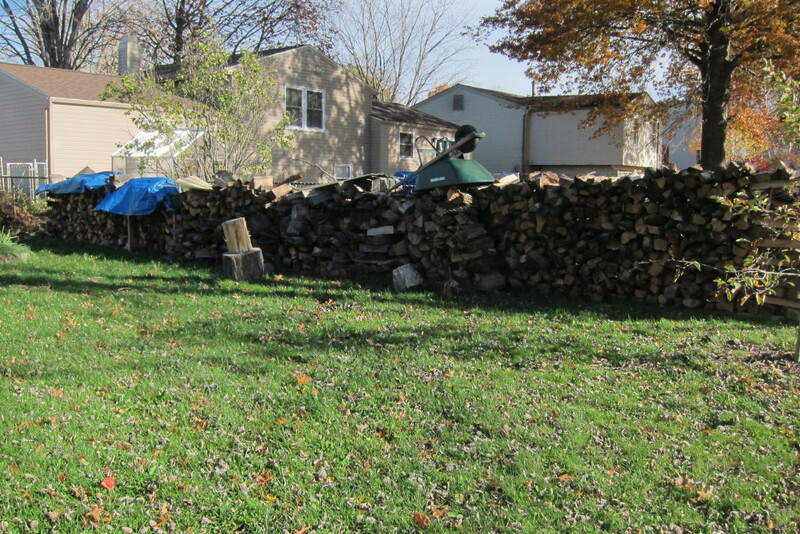 His new favorite frugal fitness synergy is chopping wood. He gets free wood from fallen trees and chops them for firewood in our backyard. The whole process results in burning lots of calories and saving money on both firewood and natural gas. Neil chopped all of this! We refuse to spend much on special clothing or gear for exercise (we do own tennis shoes!). We’ve purchased secondhand bikes, which Neil fixes himself. Aside from basic safety equipment (helmet, light, reflectors) and the kids bike trailer, we’ve avoided buying the myriad bike accessories available. It’s crazy how easy it is to transform an inexpensive pastime into a pricey one. Most of our sports equipment is used–some even trash-picked! Free videos from the library, friends, or streaming services like Youtube, Amazon Prime, or Netflix. Free or inexpensive classes at churches or community centers. Running, walking, biking, hiking, or swimming. Hold your own fitness class. If you’ve ever taken a class that you enjoy, lead a few friends in this type of exercise. Chopping wood, gardening, yard work, etc. Doing body-weight exercises like sit-ups, push-ups, “mountain climbers,” planks, jumping jacks, etc. Have you found ways to exercise for less? Have kids or budgeting changed your approach to fitness? We have T25 videos that we do off and on. We’re considering signing up for Daily Burn, a streaming exercise video service, to mix things up a bit. I am happy that our T-25 videos are paid for, but I am so tired of doing them! It would be nice to have more options. It’s $12.95 per month but the first month is free. I definitely get bored doing the same videos over & over, and I think your body becomes less challenged over time. Switching things helps me stay motivated. I have found all kinds of ways to exercise for free! I do blog work in exchange for membership at a boutique gym, I get a free membership to another gym where I work now, I get free volleyball classes because I substitute coach, I run or do free fitness apps when I can’t make it to the gym. I also used to work one yoga shift in exchange for unlimited yoga classes. It can be done! Great tip! I used to get a free gym membership when I coached gymnastics. We also just started using Sworkit sometimes. My wife and I have done a couple things in the past to save money on fitness. The most obvious one was my wife getting a free membership for working in Kids Stuff at the YMCA. Another thing that has been a big win is the gym at my work. I work for a huge company so they are able to justify an expense like that, since it probably low cost when you think of it in terms of per employee. We did join Planet Fitness a year or two ago and we like the low $10/month cost. I wish the low-cost gyms around us had better childcare. I used to coach at a YMCA and use the gym after work. That’s nice your company has a gym! I highly recommend Fitness Blender, free on Youtube. A wide selection of levels and workout times…too much variety to get bored with. Plus, I like their style. Its a husband and wife who have created a large business in their garage, where they still film. They are real and dedicated to overall health and fitness. Plus…FREE! Sounds like a great series! I get a little overwhelmed on Youtube because there are so many options, so it helps to have a recommendation. We live nowhere close to a gym, but I recently learned that a nearby aquatics center has very reasonable prices. If Rob’s doctor recommends aquatic therapy for his back, I think we’re going to get a family membership for unlimited swim time which is about $100/month, but a whole lot of fun. Otherwise, we’ll just stick to our once a week schedule which is about $10 for the three of us. It’s definitely worth finding the right exercise to help Rob’s back. That will pay off in the long run! The accountability of group fitness classes definitely helps keep me motivated. That’s a great way to get that without the gym membership. I follow a pretty similar fitness routine. Chasing babies is number one. I think picking up and carrying my chunky one-year old has kept my arms reasonably toned. I struggle with sitting in front of a computer all day, so every hour or so I take a lap around the office. We swim in the summer. Whenever possible I take walks or bike rides with the kids, or go for a jog around the neighborhood. You definitely don’t need to pay for a gym or equipment to stay in shape. Chasing (and carrying) babies is a real workout! I know this is how my mom stayed in shape when we were little. Walking around the office is also a good idea. My definition of exercise currently is doing work around the house & walking around the block and the periodic hike. Occasionally I do a workout video at home, but usually during the winter when I have cabin fever. I’d like to get back into the habit of more regular aerobic activity. But priorities change when you get married & have a baby. Personally, I if can’t exercise at home it won’t happen. As you mentioned, doing things around the house is work enough. Plus you can have a good home workout with dumbells, situps, & pushups. It can be harder to stay motivated to workout at home, but I agree it’s about the only way it’s going to happen with little kids in the picture. There are so many good, simple exercises to do at home–it’s just a matter of actually doing them without a fitness instructor telling me to! Yes, our safety equipment is new. Bikes, baseball cleats, bike trailer, jogging stroller, etc. were used. Traveling a lot would make a lot of routines harder, I imagine. Especially since you take short trips and probably don’t have much down time. I absolutely believe that every little bit helps. Something is better than nothing! If you buy a dog, you’ll get lots of exercise! Me and my furbaby go on a 3 mile walk every morning. Good point, Kate. I’m sure I’d walk more if I had a dog, but for now I prefer to keep walking my kids instead! I can relate to being too drained by a schedule of intensive workouts. I always thought it was because I just needed to be more consistent and get into better shape . . . but maybe not. Food for thought here. I thought the same for a long time, too. At some point I just realized more consistent, intense workouts did not fit with my season in life, and accepted that. My husband likes to workout at a gym but most of the time I prefer to just get my exercise wrangling our twin toddlers and walking around town, although I do love some yoga now and then! Twin toddlers provide lots of exercise, I’m sure! It’s nice to take a class or do a video without distraction sometimes, though. I also find chasing/carrying kids is a workout. But kids are also an inspiration to be active . Little kids run everywhere and do things in inefficient ways that involve crawling, clambering, and jumping. I started running around the house instead of walking, or doing really silly walks, or jumping randomly, like a toddler does. It’s a great workout you can fit in any time. It makes you look RIDICULOUS, but since when do people who are trying to live frugally care about what others think? Wow, that’s creative! Kids are super active and definitely don’t conserve energy like adults do. Chopping wood is the real deal! There are many weighs to exercise without a gym, that’s for sure. I don’t ever see a time where I don’t have a gym membership just because I enjoy lifting weights. So the $15/month is well worth it for me. But one thing that the membership has done is opened my eyes to the amount of people that have memberships and don’t need one! There are definitely less expensive, more authentic ways to exercise than what’s offered on the cardio floor. I appreciated using the elliptical running machines because they protected my bad back from the impact of running. It’s not as good of a workout, though. There are also the many who pay for gym memberships and don’t really use them. This is part of what makes these businesses so lucrative. Flash mob dancing sounds incredible. A great way to socialize & stay fit. Plus, it is much easier as you said to have classes in your own home with friends over. While I don’t have kids, I did make a recent change that helped me save $ and helps keep me fit. I made a move recently to be within a 15 minute walk to work. Before I was taking public transit which was nearly $100/month in Chicago and was just me sitting for an extra 90 minutes during a work day. Now I get to save a few bucks and get a good 30 minutes of walking in each day. It is fun! That’s great you are able to walk to work. That’s the perfect commute! I’m not even close to pretending to be fit right now, but I tend to get more active in the warmer months. I love going for walks outside, and I may even try to start running again this year. I’m considering rejoining our Y for myself. (My daughter has a membership, but I gave mine up a while ago.) This year, our health insurance plan has included a great benefit of being reimbursed for up to $1,000 in fitness/wellness memberships and classes. I’ve used it for some yoga classes, and for my daughter’s gymnastics classes. That is an amazing benefit! I wish our health insurance had the same program. That’d be great if you could exercise while your daughter is at gymnastics.